Kilpisjärvi Atmospheric Imaging Receiver Array: Ionospheric Scintillation with KAIRA Mode "357"
Last Friday, 28th September, we described how we had managed to combine use of the Low-Band Antenna (LBA) and High-Band Antenna (HBA) parts of the KAIRA array simultaneously during observations, a mode we labelled "357". We have been experimenting with this mode for two weeks now, and have even extended it a little further by dividing the HBA tiles used so that they can "point" in two different directions at once: Each HBA tile consists of 16 dipole antennas which are usually combined using an analogue beam-former. This analogue beam is quite wide (~20 degrees) and can be directed anywhere in the sky. 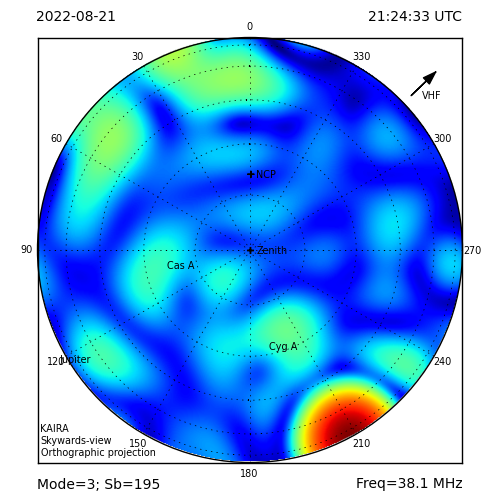 However, if we wish to use the HBA array with multiple beams, these beams will have little, if any, sensitivity if they point outside of this analogue beam. Only one analogue beam can be formed; it is not possible to form any others... unless they use different tiles of course! Now each sub-division of the complete array will reduce the sensitivity accordingly. So principally we have been using the new mode to observe two very powerful radio sources in the sky, Cassiopeia-A and Cygnus-A. Although these are quite broad radio sources, the widths of the beams we are using make these appear to be "point" radio sources to KAIRA. This means that the sources appear to scintillate ("twinkle") in radio light. 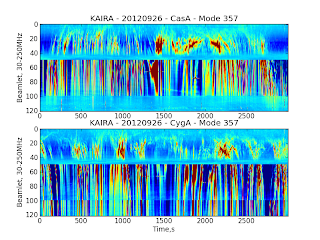 Plots from a simultaneous observation of the radio sources Cassiopeia-A (upper plot) and Cygnus-A (lower plot). The x-axis is time, in seconds, over approximately a one-hour period; each point on the y-axis corresponds to an observing frequency, with the zero point being equivalent to 30MHz and the 121 point being equivalent to 250MHz. The plots have been normalised by subtracting a running average to bring out the structures. The scintillation is exactly the same effect that we see in visible stars in the night sky: In this case, the stars appear to twinkle because of density variations moving around in our atmosphere. The effect is very much like watching a stone in a slightly rough pool of water: The stone appears to shift and shimmer with the ripples on the water. 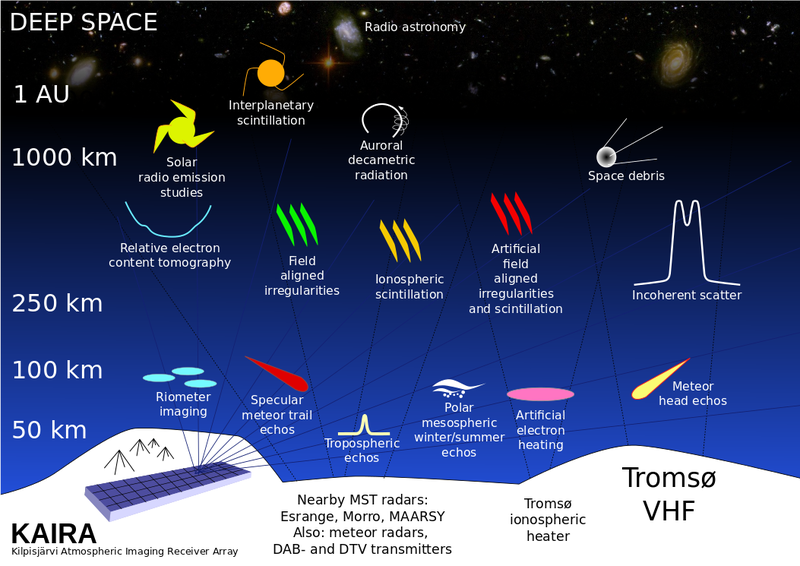 In the case of radio stars, they may appear to twinkle because of density variations moving around in our ionosphere, or the solar wind, or even the interstellar medium. The structures that we can see in these plots of data from KAIRA are most likely to be due to ionospheric scintillation. The radio waves are scattered and refracted by density structures of different sizes moving around in the ionosphere. Where the structures in these plots appear vertical at the highest frequencies, the scintillation is said to be "weak": In other words, the radio waves are scattered by the density variations but these scattered waves do not subsequently interfere between themselves. At the lowest frequencies, we can see the scattered waves interfering amongst themselves, in some cases forming a classic 'hash' pattern as the waves are alternately enhanced and cancelled as they interfere.